2011 has seen Audi launch plenty of shiny exciting new models. Cars like the A7 Sportback and the Q3 have helped the brand to fill – and in many cases create – new niches. However, its bread and butter models remain a key part of the line-up and this is certainly the case with the A4 – its best selling range. It’s a hugely important car for Audi and with an all-new BMW 3 Series on the horizon early in 2012, it’s no surprise the A4 range has been given a mid-life upgrade to keep it fresh. The saloon, Avant, allroad and also the performance S4 have all been given an updated look along with improvements to engines which now all come with start/stop as standard. From the outside you’ll be hard pressed to notice much in the way of big changes. The front lights are the main difference with a similar look to the new A6. The grille is also a slightly different shape (at the top edges) while if you look hard you can see that the front fog lights have been redesigned. The front and rear bumpers are also new. Essentially though, it’s pretty much business as usual, which is no bad thing. Some critics say the A4 is drab, but we think it's a tidy design with a fuss-free look. Admittedly the wheels fitted to the car in our pictures do it few favours, but these won’t be available on cars in the UK. Inside it’s similarly similar. But there are some detailed changes if you look hard. Along with redesigned steering wheel options there are new high-gloss or chrome trims on the dash and centre console. The MMI navigation plus system now has less buttons while the air conditioning controls have been improved too. They may not be huge changes, but they make life with the A4 easier. As always with Audi, the quality is impeccable with a top-class finish and great attention to detail. One new high-tech option is navigation that uses Google Earth images and also creates a wi-fi hotspot so that passengers can use the internet wirelessly on the move. 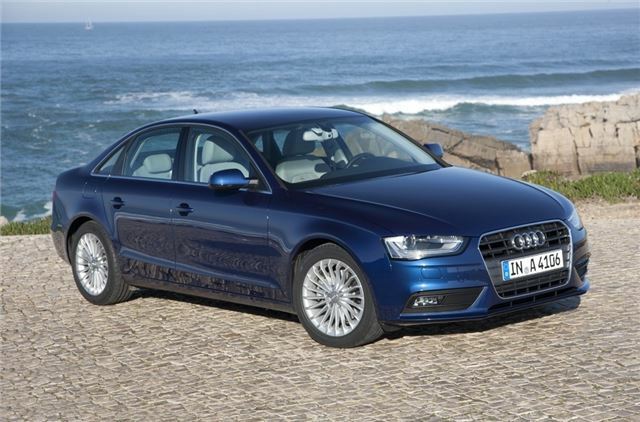 The revised models will arrive in the UK in March 2012 and prices have gone up by around £200 meaning that the entry-level 1.8 TFSI 120ps A4 SE saloon costs £23,625 on the road. The 1.8 TFSI also comes as a more powerful 170PS version and it’s a great engine which performs with real zest. While the TDI diesels may be ideal for long distance drivers, the TFSI units are more fun to drive. The 170PS accelerates from 0-62mph in a sprightly 8.1 seconds, helped by the turbo which boost torque to a healthy 320Nm. It’s surprisingly efficient for a petrol engine too with CO2 emissions of just 134g/km and a claimed average of 49.6mpg. It’s a wonderfully smooth and free revving unit that’s happy to be worked hard and never gets noisy or coarse. There’s no 3.2-litre V6 petrol anymore, so instead the top petrol is the 2.0 TFSI with 211PS – an engine shared with the Volkswagen Golf GTI – and also the only petrol model that’s available with quattro four-wheel drive. However, the 2.0 TDI, in its various outputs, is the one that most people opt for and that starts at £26,555 for the 136PS 2.0 TDIe manual. This model is the cleanest and most fuel efficient model in the range with a claimed average of 65.7mpg and emissions of just 112g/km – an amazingly low CO2 figure for a car of this size and power. To slightly confuse matters there is also a more powerful 2.0 TDIe with 163PS which is almost as frugal – it averages 64.2mpg according to the official figures with CO2 of 115g/km. These two models are the ones that go head to head with the new generation BMW 320d EfficientDynamics, one version of which is powered by a 163ps 2.0-litre diesel engine and emits just 109g/km. But the changes to the Audi 2.0 TDI aren’t just confined to efficiency. There have been tweaks to the engine itself to make it run smoother and it’s now noticeably more refined at low revs, making driving at slow speeds, such as in traffic, much easier. It’s just as good in the mid range with plenty of torque for effortless acceleration and easy overtaking, while on the motorway you rarely have to take it out of sixth gear. The top version of the 2.0 TDI is the 177PS version that is a development of the previous 170PS model. It’s a really great version of this engine helped by the 380Nm of torque that’s available from just 1750rpm so on the motorway at 70mph it’s barely breaking a sweat. The top diesel is the superbly smooth 3.0 TDI which comes in two versions. The 204PS is front-wheel drive while the all singing, all dancing 245PS comes with quattro as standard. It’s effortlessly quick and doesn’t hang about from a standstill with a 0-62mph time of just 5.9 seconds. The under the skin changes in the A4 aren’t just reserved for the engines though. All models get new electromechanical power steering which is another aid to fuel efficiency. It adapts the amount of assistance depending on your speed and has been designed for ‘sporty and direct’ handling according to Audi. It is more responsive than before but it still feels somewhat artificial and not as involving as you’d want it to be. That said, it’s very accurate and inspires plenty of confidence. You can choose Audi Drive Select as an option which lets you vary the throttle response, power steering feel and gear changes (on automatics) across various settings – comfort, auto, dynamic or individual. One new mode is efficiency which is designed for maximum fuel saving. Of course one of the most common criticisms of Audi models – particularly S line versions – is the firm ride quality. It’s something Audi has looked to address, with the improved A4 getting more finely tuned dampers and changes to the rear suspension. We only drive SE models so we’re unable to say what S line models will be like on UK roads, but first impressions are that the A4 is more forgiving than before and deals much better with bumpy roads. While the changes to the A4 are far from revolutionary, they ultimately turn what was an already great all-round car into an even more attractive buy. The A4 exudes quality and is an incredibly comfortable and refined car to live with. Put simply – it’s near faultless.